It’s the classic story video game storyline; there’s a terrible monster in a maze, guarding fantastic treasures that must be retrieved for a kingdom to be saved. It’s a classic for a reason. With gameplay which can only be described as Pac-Man meets Rip-Off, Muncher’s Labyrinth puts you in the role of the horrific Muncher, defending your convoluted home from a rampaging mob of virtuous knights. 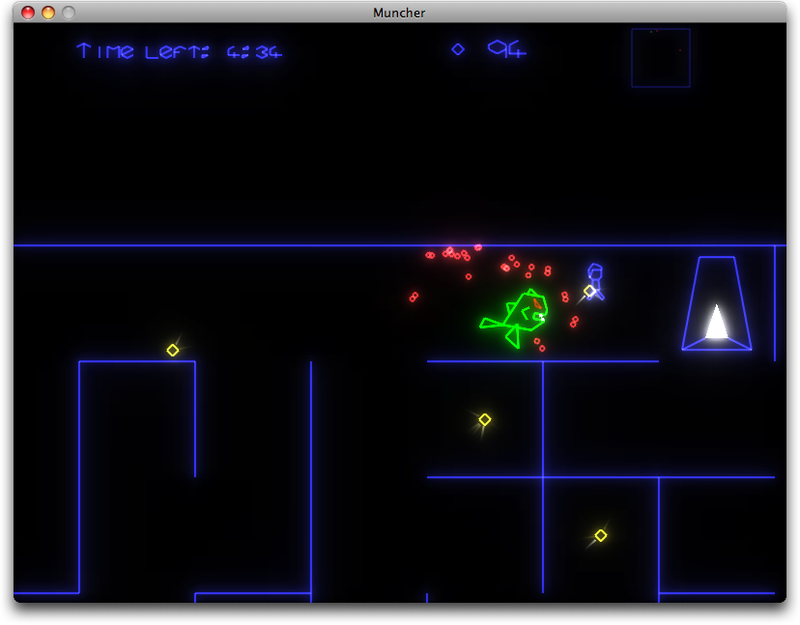 Like all VectorStorm games, Muncher’s Labyrinth attempts to use a gamepad if you have one connected. If not (or if it doesn’t work for some reason), you can control the game using the arrow keys, and the space bar as your “A Button”. You may quit the game at any time by pressing ‘Q’ or ‘Esc’. Sound Effects: Various, sourced from http://freesound.iua.upf.edu/. See the in-game credits for full details. 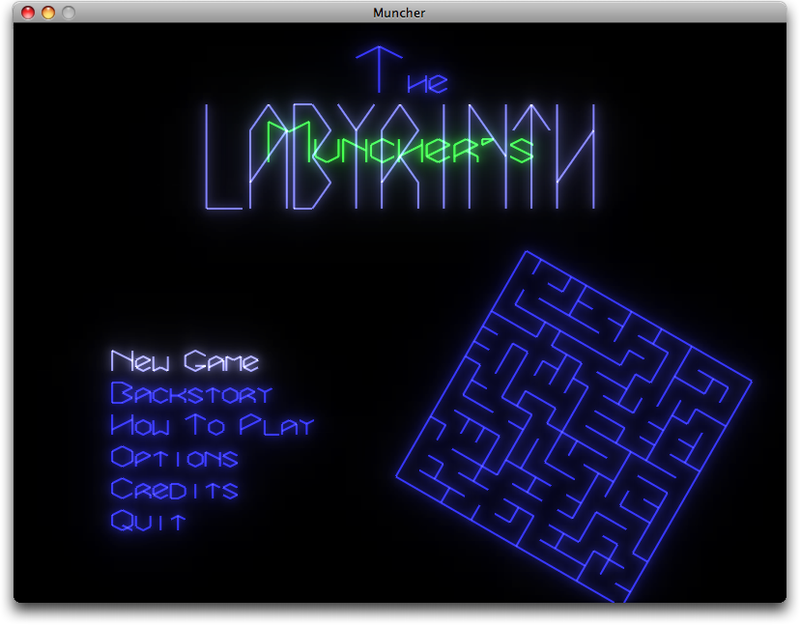 Muncher’s Labyrinth uses OpenGL, SDL, SDL_Mixer, and GLEW. 28th January, 2008: 1.0.2 patch: Added GLEW framework to OS X build. Fixed a few build issues in Win32 build. Made the svn repository public. Added a few more end-of-game statistics. 29th January, 2008: 1.0.3 patch: Fixed crashes if an enemy happens to squeeze out of the maze. Improved enemy behaviour when there are more enemies left than shinies. Fixed loading of OGG sound files under Windows. 30th January, 2008: 1.0.3.1 version for Windows, no longer requires extra redistributable libraries. 1st February, 2008: 1.0.3.1 version for OSX, fixed incorrectly referenced Glew framework. 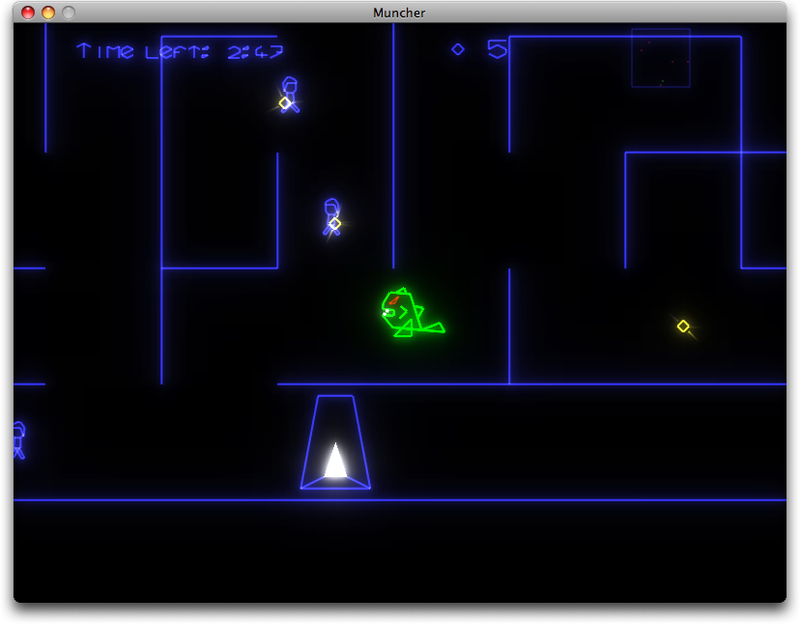 3rd February, 2008: 1.0.4 version, with fixed gamepad support for Windows and OSX. 1.0.4.1 version on Windows, now statically linked against the c runtime library. 7th February, 2008: 1.0.4.2 version on Windows, updated with fixes to the bloom shader.